ENTERING THE RIVER DART, Devonshire, to be laid up until the trooping season begins again. The Bibby liner Dorsetshire, 9,645 tons gross, was specially fitted for transport service in 1926. 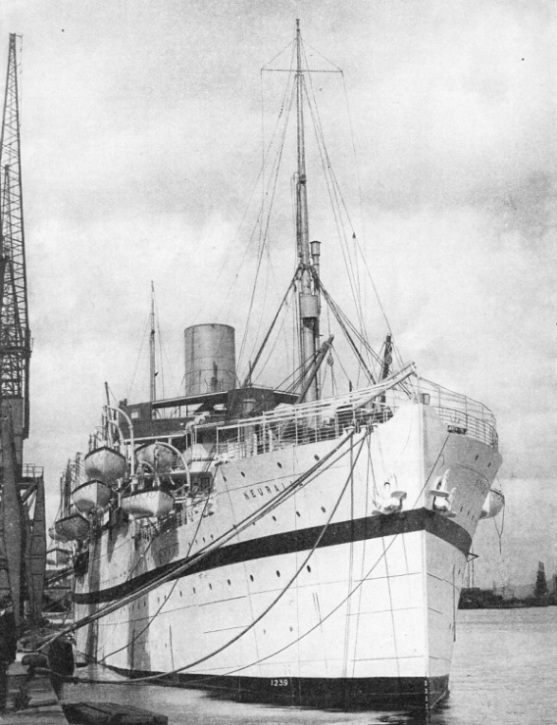 British troopships are painted white, with a broad blue band round the hull, and a yellow funnel. The Dorsetshire, built at Belfast in 1920, has a length of 450 ft 4-in, a beam of 57 ft 4-in and a moulded depth of 36 ft 7- in. THE transport of armies by water has been customary from the earliest days. Surprisingly large armies have been thus moved. Many of the great conquests were made possible only by sea power and many campaigns failed because it was not understood. The history of the ancient wars being so mixed with legend, it is impossible to arrive at exact figures, but in more than one expedition the numbers of the troops must have been so large that the army’s transport by sea would have been impossible had the ships not hugged the coast, probably beaching the boats and letting the men sleep ashore every night. In the purely military states the difficulty was generally the supply of boats. When Sennacherib, King of Assyria and Babylonia, embarked his army to go in search of the exiles of Bit-Iakin, the only ships available were those of the Chaldean States. Sennacherib, therefore, forced Phoenician prisoners to build a fleet of galleys suitable for the purpose. Caesar has left some excellent notes on the transport difficulties of his day in his Commentaries. On his first expedition to Britain, in the year 55 BC, he had a fleet of transports built in Gaul. Being much impressed by the merchant ships which «were employed on the English Channel trade, he seems to have copied them closely. The transports were heavily built. When Caesar had to land on an open coast he found that their draught was too great to bring them close ashore, so that his heavily armed and armoured troops had to jump into the water, where they were at a great disadvantage. The Viking ships were largely transports, although the soldiers rowed them, with their shields and arms close at hand, as there was no room for galley slaves. A similar type was used by William the Conqueror’s invading army. By the promise of loot and land in England he persuaded innumerable adventurers to supply their own transport, which must have included many strange vessels He eventually collected a fleet of nearly 1,000 transports and 400 men-of-war. In these some 60,000 troops with a large number of horses are believed to have been moved across the English Channel. The first really long-distance trooping problem to be solved in historic times was that, of the Crusading armies. The difficulties would appear to have been so great that the majority marched overland. Many, however, took the sea route, and the difficulties of organization must have been as great as the discomfort of the troops. The penetration of English mariners into the Mediterranean, and the observations that they made there, had a profound influence on English shipbuilding and naval architecture and made possible much of the country’s subsequent commercial progress. For the shorter distances in the Mediterranean the Italian republics supplied most of the transport facilities, and appear to have evolved special and ingenious types for the purpose. DURING THE BOER WAR of 1899-1902, many famous liners were used for the transport of troops to South Africa. This photograph shows the early Bibby liner Yorkshire leaving Southampton. A vessel of 4,269 tons gross, she was built at Belfast in 1889. She had a length of 400 ft 8-in a beam of 45 ft 2-in and a depth of 28 ft 2-in. Much of the trooping experience gained in the Mediterranean was put to good use by King John, whose numerous wars demanded big transport facilities. Sir Hugh de Bove, a Norman adventurer, collected a huge fleet in Calais Roads. In this fleet he shipped men, women and children to a total number estimated at 40,000, nearly all of whom were drowned when a sudden gale destroyed the fleet. Although Edward III did great work for the Navy, he was essentially a soldier, and his naval interest was principally to supply and protect the means of transporting his armies. Commercial shipping was encouraged to supply the facilities. The Siege of Calais in 1347 demanded a fleet of no fewer than 1,100 well-found ships. Transport fleets were repeatedly raised to carry armies backwards and forwards across the English Channel during a long succession of French Wars. As the supply of vessels owned in England was seldom sufficient, the Crown did not hesitate to use its right to requisition any foreign ships which were in English ports at the time, and whole squadrons were chartered from foreign flags. The Spanish Armada of 1588 consisted largely of transports, or of warships used primarily for the transport of troops. By that period the increased material complexity of war had made the movement of an army more difficult. It was no longer a question of moving a force across to the enemy’s territory by the nearest route, every man carrying all his own arms and prepared to live on the country. There were now special engines of war to be moved, ammunition to be considered and an elaborate supply train. Moreover, the distance was greater than in most previous expeditions. In the eighteenth century the Colonial Wars in various parts of the world demanded great transport facilities. Armies of 10,000 men and more, with impedimenta steadily approaching the modern scale, were moved long distances. The success of the operations generally depended on the cooperation of the fleet, and many ships were wrecked because of ill-feeling between the Army and the Navy. The health service on board was usually defective. Often the troops were not given even hammocks but had to sleep on the filthy decks, which could not be cleaned because of the crowded state of the ships. In 1747, when military operations were being taken against the Spaniards in the West Indies, where the mortality was always high because of fever, orders were issued that troopships were not to be chartered with a height between docks of less than 4 ft 6-in, “that the troops might be comfortable”. Perhaps the greatest trouble was in the small size of the ships, for the average tonnage of the eighteenth-century merchantmen was small. This made it necessary to split a regiment up into small detachments for transport, and in those days officers and men generally demanded a measure of control and discipline which was impossible in such circumstances. The East India Company used its big Indiamen for trooping from the earliest days of its Eastern Army, and when the two forces came into contact the War Office officials were surprised at the excellence of “John Company’s” transport service. FITTED OUT AS A TROOPSHIP. The British India liner Neuralia, with her sister the Nevasa, is chartered annually by the Sea Transport Section of the Board of Trade. The special colouring, similar in all liners thus chartered, gives the Neuralia an added note of interest. She was built at Glasgow in 1912 and has a gross tonnage of 9,182. She is 480 ft 6-in long, and she has a beam of 53 ft 1-in and a moulded depth of 34 feet. The ships were big and well armed, with a trained personnel kept under strict discipline. In them the voyage was not a time of relaxation for the soldiers, but a continuation of discipline and good order, with a fair measure of drill, which permitted them to be landed in fine fighting order. Not only were they better soldiers but also they had been far more comfortable than the men who had been given so much more licence in the smaller ships. The authorities duly noted the advantages of such vessels, and frequently employed the East Indiamen, although the Company had sufficient influence to check any tendency to charter them unfairly. A simple way out of the difficulty appeared to be to employ as transports the less useful men-of-war. There were many classes which were nothing but expensive mistakes, such as the hated two-decked 44-guns frigates. The Admiralty followed the French fashion and, having taken out the lower deck guns, they sent the frigates to sea as transports. The idea of thus using these vessels had many advantages. It permitted regiments to be kept together more and provided better conditions. If they were in danger of attack their two long lines of gun ports were generally sufficient to scare off the enemy unless he were heavily armed. If this did not succeed, the guns left to them were generally far more powerful than those of the best of armed merchantmen. The main disadvantage was that the system promoted bad feeling between soldiers and sailors. The sailors considered that the soldiers got a much better time than they did. The uniform and military routine of the eighteenth century were repulsive to the “tarpaulin”. Relations worsened until the traditional precedence was not far from the truth: “A messmate before a shipmate, a shipmate before a stranger, a stranger before a dog, but a dog before a soldier.” This foolish attitude spread to the officers and ruined the co-operation that was necessary for the success of a combined campaign. The Admiralty also objected to the fleet being depleted when every man-of-war was badly wanted, so that as a rule the Navy was relied upon only when the element of surprise was desirable. Merchantmen were employed when it was only a question of routine relief on the field. Perhaps the most interesting trooping experiment during the Anglo-French Wars was Napoleon’s invasion plan. Napoleon collected a huge army on the shore of the English Channel and a fleet to transport it. In the same way as Caesar, he saw the necessity of a special design for the work and a large number of small vessels were built to several standardized designs after a good deal of thought and consultation. The vessels had shallow draught, with good accommodation for horses, guns and men, but were well rigged for a fast passage, although it was not intended that they should be good sailers, as the attempt would naturally be made when conditions were most favourable. All through this period the Navy had the responsibility of protecting the big convoys of troopers. That was anxiety enough, for their sailing qualities were usually far behind those of men-of-war. As military operations became more complex the huge fleets of store ships and victuallers of all sorts made the problem more difficult still, for the store ships did not even have the sailing qualities of the ships that were chosen as transports. A TROOPSHIP OF 9,648 TONS GROSS, a size favoured for transport purposes, the Bibby liner Somersetshire was built in 1921 at Belfast. She is a twin-screw vessel, with a length of 450 ft 4-in, a beam of 57 ft 4-in and a depth of 33 ft 8-in. She has a corresponding draught of 22 ft 9-in. She is driven by two eight-cylinder four-stroke single-acting oil engines. In the operations of the early part of the nineteenth century, after the end of the Napoleonic Wars, the Board of Commissioners for Transport Service was abolished and its work put into the hands of the Admiralty; but, whereas formerly the sailors had been jealous of the soldiers, the soldiers now reversed the process and nothing was gained. The China War of 1840-41 put a serious strain on the transport service and demanded a large number of chartered vessels, most of which were given a heavy gun armament for protection against Chinese pirates. The Crimean War of 1854-56 was fought according to new standards and presented great difficulties to the trooping service. Mobilization found the Navy short of men and, as the Government was unwilling, for political reasons, to resort to the Press Gang, the recruiting bounties offered by the Navy drained the Merchant Service of most of its trained seamen and the transport side suffered badly. The situation was eased by the fact that most of the early steamship companies had been able to begin operations only with the help of a Government subsidy. This provided for their ships to be used by the State in wartime, so that the Cunard, P. and O., Royal Mail Steam Packet Company and other lines had to give the services of their ships to the Government at low rates. At that time, also, the Australian boom that had been caused by the discovery of gold in New South Wales had brought into being a number of fine sailing ships with big accommodation for emigrants. These made excellent transports, although in the fluky winds of the Eastern Mediterranean it was generally necessary to tow them if they were to keep schedule. At that time the P. and O. Company had recently made the experiment of building what was then the biggest steamer in the world, the iron screw-ship Himalaya, of 3,438 tons. A short experience showed that, although she was a record breaker and a wonderful ship, she was long before her time as far as the Mercantile Marine was concerned. The company was therefore willing to sell her for conversion into a naval transport for the sum of £130,000. She was one of the best bargains that the Navy ever obtained. After a long career in the trooping service she was converted into a coal hulk. In this guise she was still afloat in 1936 and doing good work. Only a few years ago she was surveyed, and her stout iron hull was pronounced to be fit to be towed anywhere in the world with safety. In the ’fifties the French Merchant Service was specializing in comparatively small ships, and did not own nearly as many big vessels suitable for transport purposes as the British. At first the French put soldiers into their fighting ships for the voyage, but they soon found that this handicapped them hopelessly when it came to using the ships for their proper function. So they chartered a number of British ships, for Great Britain was an ally in the Crimean campaign, and also several of the crack American clippers. Among the British owners from whom they chartered in that way was Duncan Dunbar. Unfortunately, he had made a practice of naming his crack ships after British victories in the Napoleonic Wars, and it was not until the Hougomont was on the point of sailing that it was realized that her name was distinctly tactless. She was hastily renamed Baraguay d’Hilliers, after the French Commander-in-Chief, before she sailed, and everything passed off pleasantly. 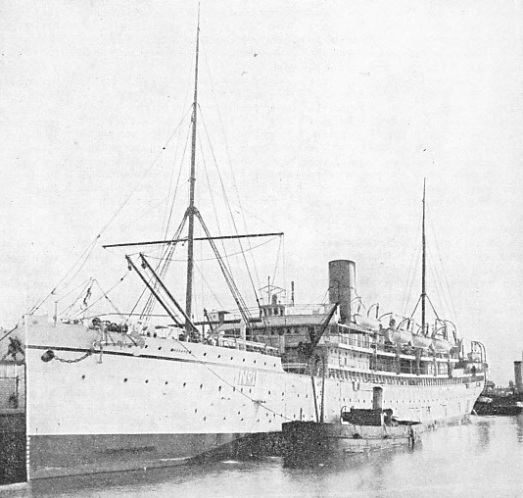 CONVERTIBLE FOR USE AS A PASSENGER VESSEL, the P. and O. liner Assaye, with her sisters Plassy and Sobraon, transported the regular reliefs to India and other overseas garrisons for many years under contract. The Assaye had a gross tonnage of 7,376, a length of 403 feet between perpendiculars, a beam of 54 ft 2-in and a depth of 36 ft 7-in. She was built at Greenock in 1899. The Indian Mutiny, which followed the Crimean campaign in 1857, strained the transport service still more, for at that time there were comparatively few steamers with sufficient coal capacity to carry troops round the Cape into the Indian Ocean. The P. and O. Line, which maintained the Indian service by the overland route, rose to the occasion magnificently. At the outbreak of the trouble the company got 6,000 troops out to the front in remarkably quick time, thus saving Bombay from the mutineers. The great bulk of the troops to the Mutiny, however, were carried in the sailing clippers, and some of the best known of the Australian cracks made a name for themselves as transports. The country’s difficulties in the Crimean War and in the Indian Mutiny naturally turned attention to the handicaps of the trooping service. In 1858 it was recommended that a regular service of Government transports should be inaugurated. The cost was bound to be heavy, but after much discussion it was decided to carry the scheme into effect. The Navy was instructed to build and operate five specially-designed troopships for the Indian Government. These were built in 1866, but, in anticipation of the Suez Canal being opened three years afterwards, they were given dimensions which would permit them to pass through that waterway. They were the famous Crocodile, Euphrates, Jumna, Malabar and Serapis, magnificent-looking rigged screw transports. with a speed of 15 knots. Each was designed to carry a full battalion with its supernumeraries, about 1,200 men in all. The Indian Government was to pay the bill but the Navy was to run the ships. For many years these ships maintained the routine Indian trooping service. In their early days they were better than anything else on the service, cutting down the passage by a big margin, but as they got older they dropped far behind the standards of the contemporary merchantmen and were bitterly criticized. When the P. and O. liners which ran alongside them, and generally passed them at sea without any difficulty, were offering excellent comfort and ventilation, the troopers were stuffy and ill-lit. They were unpopular with the Navy, for the average officer regarded an appointment to one of the “lobster pots” as being a sure side-track from promotion. The Admiralty complained that about 1,200 trained-officers and men were being used. The India Office retaliated by saying that the Admiralty was charging far too much for its services, and that the money which was supposed to be spent on refits and maintenance in Portsmouth Dockyard was generally spent on some man-of-war whose condition the Admiralty had not dared to mention to Parliament. early eighties, the first Boer War and the Russian scare of 1885. Merchantmen were also occasionally used for the ordinary trooping seivice when it was too much for the regular ships. In the year 1891 the great change was made. The Serapis and her sisters were obviously wearing out rapidly and, with so much money being spent on naval construction, it was doubtful whether Parliament would supply the funds to build ships to replace them. The trooping service was a nuisance to Portsmouth, but the London and South Western Railway was willing to offer superior facilities in Southampton Docks. The Crocodile, Euphrates, Serapis and Jumna were in a bad state and would require a considerable outlay if they were to continue on the service. So the decision was made. Only the Malabar was retained and, in place of the other four, the Britannia and Rome, of the P. and O. Line, and the Dilwara, of the British India, were taken up on charter. AUSTRALIAN TROOPS on board the Demosthenes during the war of 1914-13 Built in 1911 at Belfast, the Demosthenes had a gross tonnage of 11,223 She was 500 ft 7-in in length between perpendiculars, with a beam of 62 ft 4-in and a depth of 39 ft 5-in. She belonged to the Aberdeen White Star Line and was one of the numerous liners that acted as troopships during the war. She was broken up in 1931. Everybody was surprised at the result. Officers and troops were infinitely more comfortable in the passenger quarters of the regular liners, and the cost to the Government was far less. The companies found it paid so well that it was worth their while to refit the ships completely and, rather than change them backwards and forwards continuously, to lay them up for the slack season. The usual charter rate was 17s. 6d. per gross ton a month for six months between September and March, the Admiralty paying various charges and putting a Lieutenant into each of the ships. 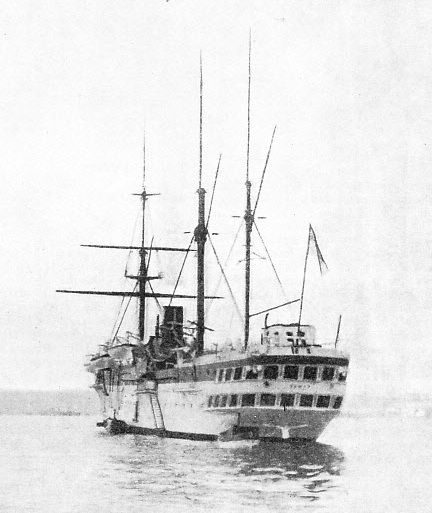 The last of the Government troopers, the Malabar, was discarded before the 1896 season. After that date the companies were entrusted with the business entirely. The remarkable elasticity of this service was shown in the Benin Expedition of 1897, the Omdurman Campaign of 1898 and numerous other minor wars, culminating in the Boer War of 1899-1902. That unhappy campaign necessitated the transport overseas of the biggest British force that had ever left the country and the Admiralty Transport Department had to draw on the whole Merchant Service. 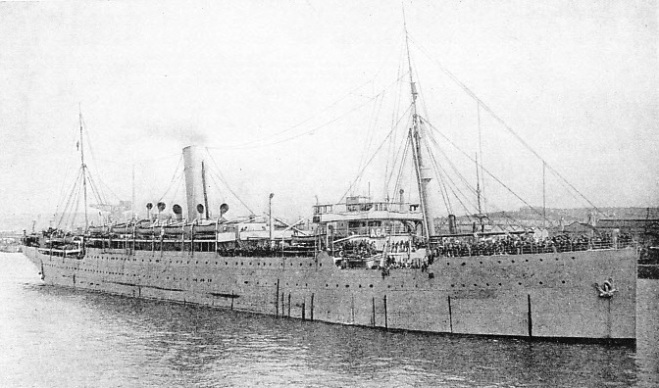 The ships of the Union and Castle Companies, later united into the Union-Castle Line, had been specially designed for the South African service, generally after consultation with the Government, which had its eye on their possibilities as long-distance troopers. They proved themselves the most useful transports of all, but not far behind them were the P. and O. and British India ships, which had been on the peace-time trooping service and were specially fitted for it. 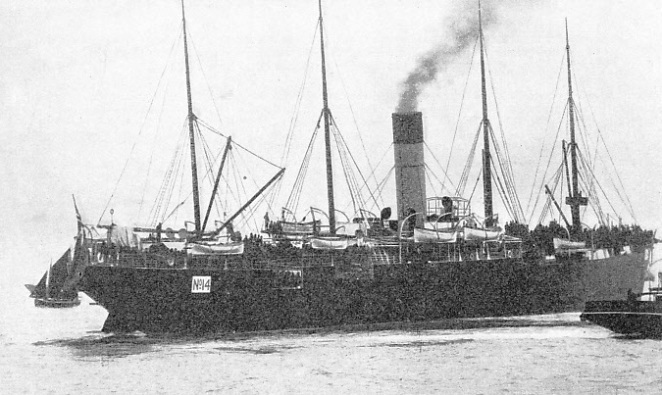 To the general public the crack Atlantic liners, designed to break records over a comparatively short course, proved disappointing and were among the least satisfactory of the transport fleet. Regular troops were moved from India by the ships of the companies which normally ran there and volunteers from Australia and New Zealand by the big vessels that were ordinarily on the emigrant trade. In addition scores of cattle ships carried remounts from the United States and the Argentine, and almost every type of ship was taken up for the carriage of ammunition and stores. Even sailing ships were useful. Dozens of them carried out to South Africa the rails and other material which were needed for the strategic railways. Between the Boer War and the outbreak of war in 1914 the contract method of carrying the regular reliefs to India and the other overseas garrisons answered perfectly. The P. and O. Company built the Assaye, Plassy and Sobraon specially as transports, although they were convertible into intermediate passenger liners if they were not wanted on that service. The British India Company followed a similar policy with the Nevasa and the Neuralia. DESIGNED TO CARRY A BATTALION, the Jumna was one of the five rigged screw transports that maintained the regular trooping services to India for many years. With a displacement of 6,211 tons, the Jumna was 353 feet long, with a beam of 49 feet and a depth of 20 feet. Built in 1865, she had a speed of 15 knots. If shipping was flourishing they were reconverted into passenger ships and used on the Indian or Eastern services between trooping seasons, but as a rule they were laid up in Southampton Water. They carried all the stores and water that was necessary, their ’tween decks were well ventilated and equipped to accommodate the men in hammocks, and to every ship an additional Chief Officer was appointed under the name of Troop Officer. The war of 1914-18 was the greatest test for the transport services, for never before had war been waged on such a scale. Before the outbreak the British Government appreciated the possible necessity of getting an Expeditionary Force across to Belgium if it were invaded in violation of the treaty. It was impossible to rehearse the action, or to keep the troopships ready; but, to formulate practical plans, at least, a committee consisting of the heads of the Cunard, Royal Mail, White Star, Blue Funnel and P. and O. Lines was set up to go into the matter. Sir Thomas Royden of the P. and O. and Sir Lionel Fletcher of the White Star dropped all other work to make the necessary plans, so that the British Expeditionary Force arrived on the Continent three days before it had been considered possible by the experts. At the outbreak of war a Royal Proclamation authorized the Admiralty to requisition merchant ships as transports, 250 being reckoned as the necessary number. There was a certain amount of confusion, for so many of the ships were loaded, but in sixteen days from the outbreak of war an Expeditionary Force of 210,000 officers and men, 62,000 horses and 100,000 tons of stores and munitions had been landed. Garrisons in the outlying portions of the Empire were brought to Europe and Territorial units sent out to replace them. As enemy surface ships were still in being it was necessary to convoy the principal transport fleets, but they came through without loss. As the struggle grew in magnitude it became necessary to commission more and more ships, not only for the transport of troops but also for the innumerable items of stores and munitions that were wanted. Nearly every type in the Merchant Service was used as a transport of some sort, including giant liners, smaller liners and cross-Channel packets. When the Americans began to cross the Atlantic in their thousands, they set a new standard of transportation. Soon after the Armistice no fewer than 10,000 men were taken home in the Leviathan at one time. During the war the Transport Department provided for 23,700,000 individual passages, in addition to vehicles and guns, and this number does not include the work done by British ships for the Allies. After the war the huge task of repatriating the British Dominion and Allied troops was carried out principally by British ships. Since the war the trooping service has cost the Army about £750,000 a year. It is in charge of the Sea Transport Section of the Board of Trade. This body pays the shipowners and in its turn recovers from the War Office, obtaining smaller sums from the Admiralty and Air Force. The War Office recovers part from the Indian Government, for the greater part of the service is for that Government’s benefit. A number of suitable liners are chartered year after year for trooping. While so employed they are painted white, with a broad blue band round the hull and a yellow funnel. In 1935 the Bibby Line supplied the Lancashire, Dorsetshire and Somersetshire, and the British India Line the Nevasa and Neuralia. These are all ships of rather more than 9,000 tons gross and all have a speed of 15 knots except the 12½-knots Dorsetshire and Somersetshire. They are so completely fitted for trooping that they do not, as a rule, return to their ordinary commercial service during the off season. The difficulty of this system of chartering passenger liners from the Mercantile Marine lies in the fact that there are few modern passenger ships of the right type with the tonnage that the Army wants for the transport of a complete battalion and a few details. Too small a ship would be a retrograde step for the comfort of the men and one too large would be wasteful. This difficulty has been overcome by granting contracts for a number of years which make it worth the while of a shipping company to build a ship specially. The first ship so built was the British India Dilwara of 1935, a motorship of 11,050 tons register, with a sea speed of 15 knots. She has comfortable accommodation - specially designed for the purpose - for the officers, noncommissioned officers and men, in addition to taking a number of soldiers’ wives and children. The officers and warrant officers have their cabins, the sergeants their comfortable messes, the rank and file their hammocks and the families excellent little three- and four-berths state rooms. Everything is so designed that there is the maximum of comfort and the large numbers can be fed without difficulty or delay. In an emergency, such as the occasion when British lives were threatened in China, any suitable ship of sufficient speed is hurriedly taken up. Then the same standards of comfort and efficiency cannot be expected. In 1936 the battle cruiser Repulse embarked a battalion at Gibraltar and took it to Malta, where it was transferred to the cruiser Exeter and taken on to Egypt, which had been denuded of troops owing to the troubles in Palestine. Such methods are justified in an emergency, but for normal work it is always the Merchant Service which supplies the Army with its transport. SPECIALLY BUILT IN 1935 the British India troopship Dilwara. This motorship of 11,050 tons gross has a length of 490 feet and a sea speed of 15 knots. She has comfortable accommodation for officers, non-commissioned officers and men, and there are excellent state rooms for soldiers’ wives and children. About 1,150 troops can be carried. You can read more on “Auxiliary Ships” and “The Convoy System” on this website.